Formulated from pure shea butter, vitamin E, rosehip oil, aloe vera, calendula and essential oils to smooth rough skin, reduce the appearance of redness, even skin tone and repair the natural beauty of skin. 100% Vegan. Essential oil of mandarin is added for its ability to smooth skin and repair the natural beauty of your skin. 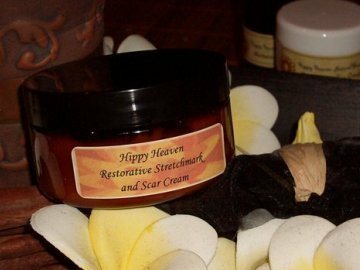 Rosehip Oil is an incredible, rejuvinating oil high in Vitamin A, which may be used by those with keloid scarring and stretch marks. Calendula and Evening Primrose Oil soothe and moisturise skin. The natural ingredients in this cream make it suitable for use during the second and third trimesters of pregnancy. A wonderful, natural, active product to repair the beauty of your skin, suitable for even the most sensitive of skins. "This would have to be THE MOST FANTASTIC cream I have ever tried! I've tried several different types of creams & lotions to try & reduce the appearance of stretch marks on my tummy but this is the only one I have seen a difference with. Within just 2 weeks I've seen (as has my husband, so it MUST work ;)) a big change in the look & feel of my stretch marks! Thank you OH SO MUCH for making such a wonderful product."